This exhibit is closed and under renovation. We apologize for the inconvenience. The Earth Forum is an engaging arrangement of 11 interrelated work stations. 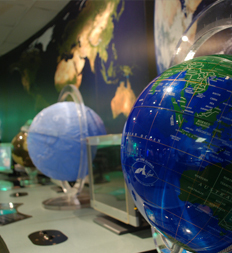 Each work station contains two computers, a globe surrounded by photographs of Earth, and a physical interactive related to the work station’s theme. In the sand dune maker, a pivoting fan causes winds that shapes and reshapes dunes forming in the sand. On the earthquake table visitors use blocks to make a sturdy structure and then press a button to cause an earthquake whose magnitude they can adjust. In the cloud maker’s cool air, water vapor condenses into water droplet clouds that visitors can feel and observe hovering in a bowl of cooler heavier air. The wave machine contains water with blue coloring and a clear oil. The water is denser and cannot dissolve the oil. Tilting the tube causes both liquids to flow downward. The heavier water flows under the lighter oil, producing wave motions. A spinning currents globe creates weather systems within the liquid. As the globe turns, currents near the equator travel faster than currents near the poles. The interactions of these currents cause turbulence to form. The visitor can change the speed and direction of the turning sphere. In the tornado tube, a mist of water droplets forms and rises in the column of air above the fan. The result is a visible vortex resembling a tornado. A tropical terrarium reproduces a rainforest ecosystem with lizards and frogs. Lights above replicate the spectrum of sunlight needed to keep the plants healthy. Population tubes show the world’s growing population by continent for 1800, 1900, and 2000. The Earth Forum represents a collaboration in which the Museum developed the physical exhibition and the NASA-funded Museums Teaching Planet Earth Project at Rice University created the 22 software components.